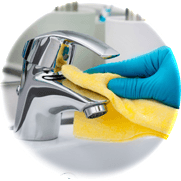 Bond & Vacate Cleaning - We endeavor to make our first service the best service. However if there are any issues the property manager may find, we can return until they are 100% happy. Carpet & Upholstery Cleaning - We are able to get most stains out of carpets and fabric upholstery. However if a stain is allowed to set it may be difficult to extract. TIP: Try dabbing Soda Water or white vinegar on stain immediately after the spill. Then call us to attend with our steam cleaning equipment and extract the offending stain from your carpet or your treasured piece of furniture..
Spring and General Cleaning - We can tailor your house clean to whatever your cleaning requirements may be. We will endeavor to exceed your expectations and make your home feel clean and fresh again! Office Cleaning - With all our cleaning services we want you to be 100% happy with the results. Our office contract cleaners are schooled in any site induction procedures required. Our supervisory staff are able to visit all our work sites to ensure cleaning services are being carried out to the clients needs and requirements. "We really CANN stand by our guarantee"